As she sat in the recovery room after her abortion, Emily turned to look at the woman in the chair next to her. In 2008, Emily was a sophomore at a Philadelphia-area Catholic school. After discovering she was pregnant, her parents issued an ultimatum: have an abortion, or leave the house. Unable to find a safe living situation, however, Emily was forced to return, and her parents whisked her to a Planned Parenthood clinic. “I was never the same again,” she said during a recent telephone interview. To cope with her feelings of grief and anger, Emily began using drugs and ended up homeless. Like Emily, Diana suffered from depression after her abortion. In 1994, as a thirty-year-old single woman, she found herself pregnant while in a casual dating relationship. Anxious and confused, she sought an abortion, and began taking Vicodin afterwards to numb the emotional pain she felt. While the medical community continues to debate the existence of a “post-abortion syndrome,” many women have nonetheless found solace through a structured grieving process. In Japan, women who have had abortions often perform a Buddhist ritual known as mizuko kuyo, in which the unborn child is commended to Jizo, a bodhisattva (or saint) who ensures its safe passage to the afterlife. Stafford Betty, a professor of religion at California State University, Bakersfield, notes that the ritual includes placing a stone mizuko doll, dressed as a baby, before a statue of Jizo in a cemetery or temple, and offering prayers of apology. In the United States, a number of initiatives provide women with post-abortion resources. Rachel’s Vineyard, a weekend retreat model developed by psychologist Theresa Karminski Burke, offers participants the opportunity to reflect on their abortions through group activities, discussion and prayer. Founded in 1995, the outreach – now a ministry of Priests for Life – features over 1,000 retreats per year in 49 states and 70 countries. After attending the Rachel’s Vineyard retreat, both Emily and Diana felt forgiveness and relief. “It was a life-changing, positive way to deal with the grief,” said Diana. During the retreat, Emily reconciled with her mother, who accompanied her daughter after “seeing how destroyed” she was after the abortion. The session included the chance to sit before the Eucharist in a rocking chair, holding a doll that represented the unborn child. “It allows you to connect with that child in the presence of God,” Emily said. A unique statue in Santa Cruz, California provides a similar opportunity. Designed by artist Thomas Marsh, the seven-foot bronze image depicts St. Joseph, seated on a curved bench, holding a six-month-old fetus in his hands. 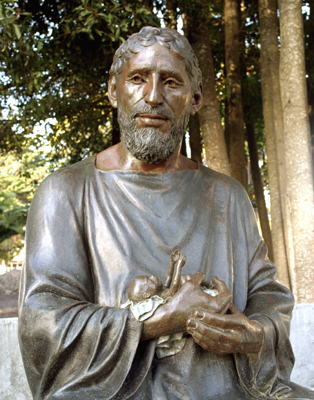 The statue is located in the center of a large, carefully tended garden at the Shrine of St. Joseph, Guardian of the Redeemer, at the provincial house of the Oblates of St. Joseph. Visitors are invited to sit on a bench opposite the statue, which was erected in 2001, and to memorialize the names of aborted or miscarried babies on plaques that hang on nearby walls. 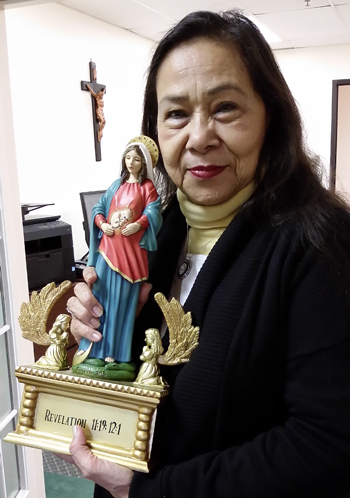 “Naming the child is such an important part of the healing process,” said Karen Newcomb, media and communications coordinator for the shrine’s evangelization efforts. Newcomb notes that both the statue and the shrine – located on a busy, scenic drive along Monterey Bay – draws thousands each year from a variety of spiritual backgrounds. Oblate provincial Father Paul McDonnell said that St. Joseph is an ideal patron of the unborn, since he was entrusted with Jesus – and since he too wrestled with fears and anxieties about fatherhood. In fact, Father McDonnell believes that for both men and women, the sacrament of reconciliation is key to healing from an abortion. “You’re receiving the grace and the mercy of God, which heals the pain and the damage to the soul,” he said. Estela Reyes-Bugg, coordinator of Project Rachel for the Archdiocese of Philadelphia, agrees. “The healing takes place when you’re in touch with God,” she said. Project Rachel, the Catholic Church’s ministry to those who have been involved in abortion, encompasses a wide range of resources that include pastoral counseling by trained clergy, individualized therapy and retreats such as Rachel’s Vineyard. In the Philadelphia archdiocese, the ministry was established in October 2016 as a collaborative effort between Catholic Social Services and the archdiocesan Office for Life and Family. Reyes-Bugg, a social worker with over twenty years of experience, stresses the importance of one-on-one counseling sessions in addition to group retreats, so that participants can address specific issues in greater depth. Due to the shame associated with abortion, many women are reluctant to seek help, Reyes-Bugg observes. Through consistent and compassionate outreach, her team has provided “very confidential” counseling for 23 individuals to date. Fluent in both English and Spanish, she also focuses on making Project Rachel’s resources available in a number of languages. Her office is planning to hold a Spanish version of the Rachel’s Vineyard retreat in April 2018. “My mission is to offer hope to all who have suffered from abortion,” said Reyes-Bugg. And that hope is what both Emily and Diana now look to share with others who have had abortions. For confidential information about Project Rachel in the Archdiocese of Philadelphia, call (215) 587-2472 or email ebugg@chs-adphila.org. God bless all women who have had an abortion. I can sympathize with them. I pray every night for similar crimes I committed during the Vietnam war.